Instructors – Name and shame bullies who terrorize novice drivers here. Learning to drive is a frightening experience for almost every new driver! We all remember it with a considerable amount of embarrassment and shame, and sometimes with anger. It happens to every driving instructor possibly on almost every lesson – your client is quietly driving along, to the best of his or her ability; white knuckles on the wheel; barely breathing; when some very aggressive driver in a fast vehicle comes up behind your car and starts tailgating you, hooting and swearing, and shouting all kinds of abuse. In most cases they overtake on a no-overtaking line, narrowly risking a head-on collision with oncoming traffic, and are soon gone, but it leaves the learner driver feeling guilty, incompetent and humiliated. A woman stalled at a traffic light. The guy behind her kept hooting loudly. She became more and more flustered. The more she tried to get started, the more she stalled. We all know how terrifying our first drive in traffic was, especially when we were still battling with a lack of clutch control and the strong possibility of stalling in front of traffic. What we as driving instructors can’t understand is why certain people feel entitled to frighten a poor new driver so badly. I had a man tailgate my student, bare inches from our rear bumper. We were on a narrow winding road early on a Sunday morning as I was trying to have her follow a long and winding road to gain some sense of looking ahead and vanishing points. There was no place to turn off nor for us to pull over and allow him to pass. It was divided by a double yellow line which here means absolutely no overtaking. She was in a panic, but I talked calmly to her and at the first opportunity I had her pull over to allow him to pass. His rage must have been fully ignited by this point as instead of passing us and racing away as I expected, he pulled past then stopped blocking us on the road. He climbed out of his plumbing truck with signs and a phone number on it and brandishing a pipe wrench, headed towards the car. I told my student to lean on the horn and I pulled out my cell phone and mouthed 911. He glared through the window then got back in the truck and drove away. I called the police as it is against the law to threaten or interfere with a student driver here and then I calmly phoned the company number on the truck and reported him. I am sure no Sunday morning plumbing emergency can excuse that kind of behaviour. I don’t know what the laws are in your country, but dialing the 911 emergency number or leading him to the nearest police station as he follows you are two options that I would take. Good luck in your new career and don’t be discouraged, There aren’t that many morons out there. Most people are happy that we do what we do and there is good job satisfaction in this work, I have been at it almost 30 years. Members constantly complain of abuse of their learner drivers, but in South Africa, we have virtually no recourse. There is no law in South Africa against threatening or abusing a learner driver that we know of. One tiny, dainty blonde instructor, wearing high heels, told her learner to stop the car, pull the parking brake up, go to neutral, and turn off, while she got out and approached the huge guy sitting in the car behind them. 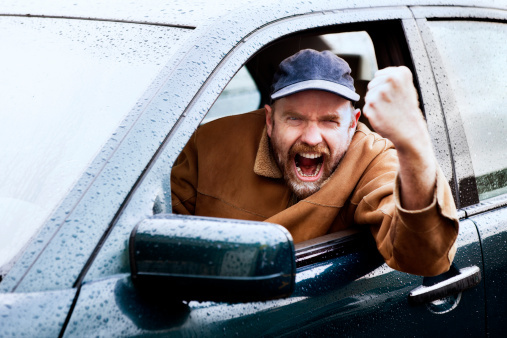 She made a terrible decision – fueled by her understandable frustration or road rage (?). She grabbed him by the tie and collar, hauled him up out of the open window, and planted a hard punch on his jaw! He took her to court and won the case of assault against her!! Stay calm members, don’t get aggressive – tell us your story here and provide his /her number plates, a description of the vehicle and the place and time it happened – let’s get even by shaming these Neanderthals publicly!